Halloween 2018 Event! Looking for Submissions. From The Depths - Forum Announcements Change logs (Patch notes) Halloween 2018 Event! Looking for Submissions. Looking for some Halloween inspired for a special campaign this year. Unlike the last Halloween even in 2016, I am brocading what is being looked for. I want to encompass more of what Halloween actually is, which isn't just horror and scary stuff, but also the costume and dress up part. The campaign might be a tower defense-esque campaign, where the player defends against hordes of enemies sent at them. The starting zone might have some land, port like in structure, unknown for now. As for crafts, anything you think is Halloween related. I'd like to keep crafts below 10k blocks, less than 20k volume. Some of every size will help. The smaller it is, the more it'll be spawned in. Every craft needs heartstones and a place to sit and control the craft. The emphasis is on looks. Gimmicks are ideal, but do have it work. Please don't just have the craft made out of just HA, the crafts should be around campaign's Regular difficulty. No Repair bots or repair tentacles. A base for the player which will be on land, perhaps 2 starting towers. Please post images with submissions with a quick description of its weaponry/gimmick etc. Please don't post too many images. The Candlestick. Armed with 4 6m fragmentation missiles, meant to bombard a players defences and ships from a distance. In the case of sufficient interception, it also launches flares to distract IR missiles nearby. Advances to 650m of the target then just hovers and shoots. @mongboy Loving the skill, the pipe makes it better. @Neth5 not bad, the base could use some more paint? maybe. keep them coming, the new dev test missiles will be allowed as they'll be stable before this Event is released! Not particularly good at fighting but is more for looks. 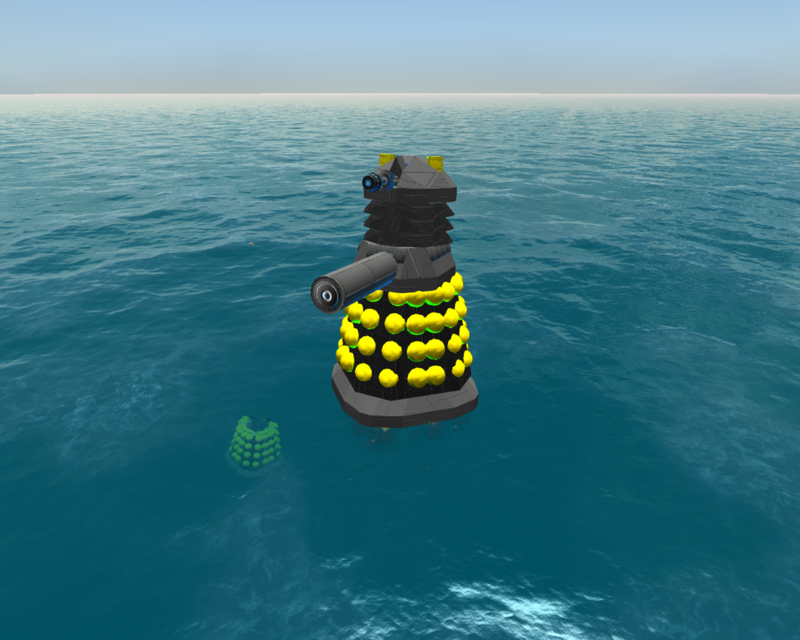 A small spammable laser toting Dalek. While it may be a glass cannon, well, it is cheap, and it is a DALEK! GIMMICK: The only major detection equipment is in the head, a camera, and that head has ammo in it, the idea, to simulate the Dalek's in-show weakness of the eye stalk. NOTE: I am considering making a larger, different, version either the Dalek Emperor, or the Dalek Commander (Or both), inspired by their namesakes. Do you want them?